For the past couple of months, I’ve really been enjoying “Jason Thompson’s House of 1000 Manga,” a new column at Anime News Network. 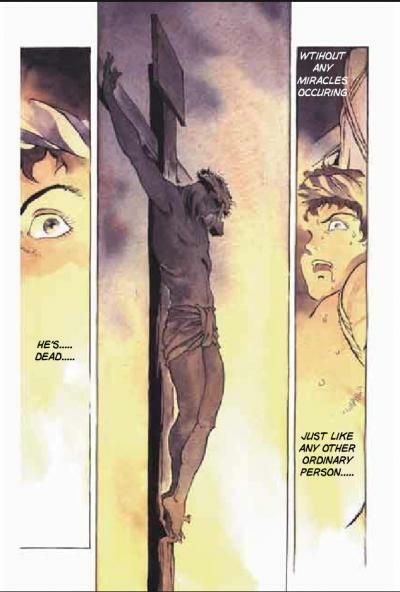 This week, he’s featuring a manga many Christians might either rejoice about or dislike: Yoshikazu Yasuhiko’s Jesus. His conclusion is that the manga doesn’t take a stance on Jesus’ divinity (or even leans away from it), and Thompson correctly concludes that some Christians will be offended by exactly that. What Thompson spends some time on, and what I find most troubling, is the artist’s apparent framework in which Jesus is depicted as being at the will of outside forces. I’d like to point out that in Biblical accounts, it’s important to note that Jesus Christ, from the moment of His betrayal, is continuously the most composed figure throughout the rest of the narrative. He understand the Father’s will and perfectly submits to it. He was in complete control. Thompson mentions that Christians “are most often offended by…depictions of Jesus.” I’m not at all sure where this idea came from, or exactly what he means by depictions. Although I don’t like to see Jesus depicted as anything less than the Son of God, I’m not especially offended when He isn’t, or when He and His life are otherwise illustrated in less-than-Biblical ways. Thompson’s atheism comes through in the review, but I think he does a tremendously fair job of discussing faith matters unbiasedly (better than I would do in the opposite situation, I think). His review is, as expected, focused on the manga, not on other tangential matters. I find it interesting that the narrator of the story is named Joshua; Joshua is the Hebrew name for Jesus, so in effect, the two main characters of the manga have the same name. I wonder if this was intentional, or a misstep by the mangaka. Thompson makes a few errors about the Christian faith, including believing that the end times is first mentioned in Revelation, when Jesus (and the Old Testament prophets) prophesied about them as well. Thompson’s final line is very clever. Read the entire article at Anime News Network. For a more biblically-based considering reading the excellent works by Manga Hero, including Paul: Tarsus to Redemption and Many Are Called.